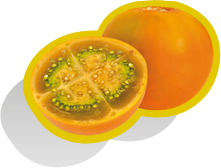 has a round shape, between 4 and 8 cm in diameter and weighs between 80 and 100 g. The skin is sleek and orange at maturity. The pulp is greenish and bitter with many seeds. The Lulo is characterized by its bittersweet and vivid flavor similar to a citrus fruit. Its unique taste will not leave you indifferent.